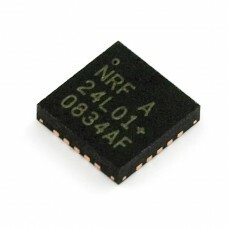 The nRF24L01 is a highly integrated, ultra low power (ULP) 2Mbps RF transceiver IC for the 2.4GHz ISM (Industrial, Scientific and Medical) band. With peak RX/TX currents lower than 14mA, a sub μA power down mode, advanced power management, and a 1.9 to 3.6V supply range, the nRF24L01 provides a true ULP solution enabling months to years of battery lifetime when running on coin cells or AA/AAA batteries. The Enhanced ShockBurst™ hardware protocol accelerator additionally offloads time critical protocol functions from the application microcontroller enabling the implementation of advanced and robust wireless connectivity with low cost 3rd-party microcontrollers. The nRF24L01 integrates a complete 2.4GHz RF transceiver, RF synthesizer, and baseband logic including the Enhanced ShockBurst™ hardware protocol accelerator supporting a high-speed SPI interface for the application controller. No external loop filter, resonators, or VCO varactor diodes are required, only a low cost ±60ppm crystal, matching circuitry, and antenna.